This beautiful statue of Isis recently sold at Christie’s auction house for the world’s record setting price of $6 million dollars. It is now in the hands of a private collector. The statue is Late Period dynastic, about 664-525 BC, is made of greywacke, a very hard, dark-grey sandstone, and sits slightly over two feet high. But when you look at this image of the Goddess, rather than thinking of the power of money to acquire rare and beautiful things. Think instead of the power of words. We often take words for granted as we communicate in work emails, casually speak with our friends, or yell at the cat to get off the table. But we shouldn’t. Words have power. Words have magic. Remember the first time someone said to you, “I love you.” Did you not feel the power of those words? Did hearing them not cause a flow of energy through your body, a thrill in the bottom of your belly, a flood of emotion in your heart? On the flip side of the coin, we adults often struggle against the negative words spoken to us as children: you’re a loser, you’re ugly, I hate you. Those words, too, have a visceral effect. I say all this to tell you what’s important about this image of the Goddess; it’s not Her price tag, but Her words. 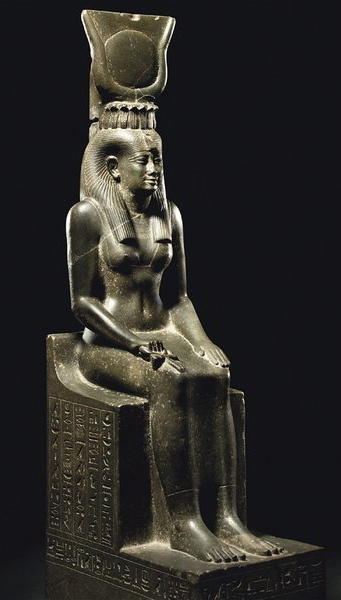 This work has been identified as a healing statue of Isis. Thus the hieroglyphs thickly covering Her throne are a healing formula. The ancient Egyptians would have used this image by pouring pure NIle water over the statue so that the magic of the words infused the water. Then the patient would have drunk the healing water. To the Egyptians, the sounds produced during the pronunciation of the words and even the letters used to write them had an equal share of magic. A Hermetic text from the early centuries of the Common Era expressed the Egyptian tradition that the quality of the speech and the very sound of the Egyptian words contain the energy of the objects of which they speak and are “sounds full of action.” This is precisely why magic words are powerful: they contain the energy of the objects they name, and this energy is the energy of original Creation, when all things were as they were intended to be. By accessing this primordial power, we may use it to bring about desired changes—such as healing. At Busiris, Isis was even called Djedet Weret, the Great Word itself. This concept may be familiar to many of us from the idea of Jesus Christ as the Logos—the Word (of God)—in Christian myth. Thus this idea is neither unique nor original to Christianity. I believe this is because, at least on a gut level, we human beings have always, always understood the power of The Word. 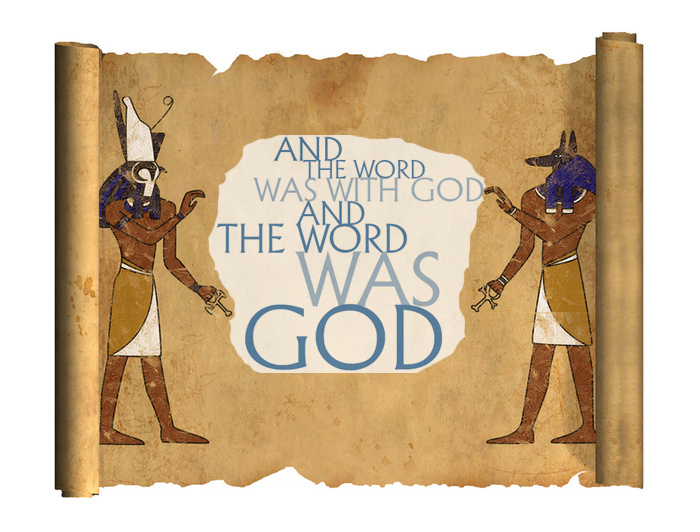 We can look to the ancient Egyptians as one of the earliest models of a society with great reverence for the Sacred Word and to Isis as an early model of a Deity Who personifies the Great Word. One can only wonder what the purchaser knows about it. Thanks for the reminder about the power of words.